The Grenadines are one of the last unspoiled island destinations in the world. They consist of about 35 islands, cays and rocks in the Southern Windwards. They belong to 2 different Caribbean countries: Saint Vincent and the Grenadines and Grenada. 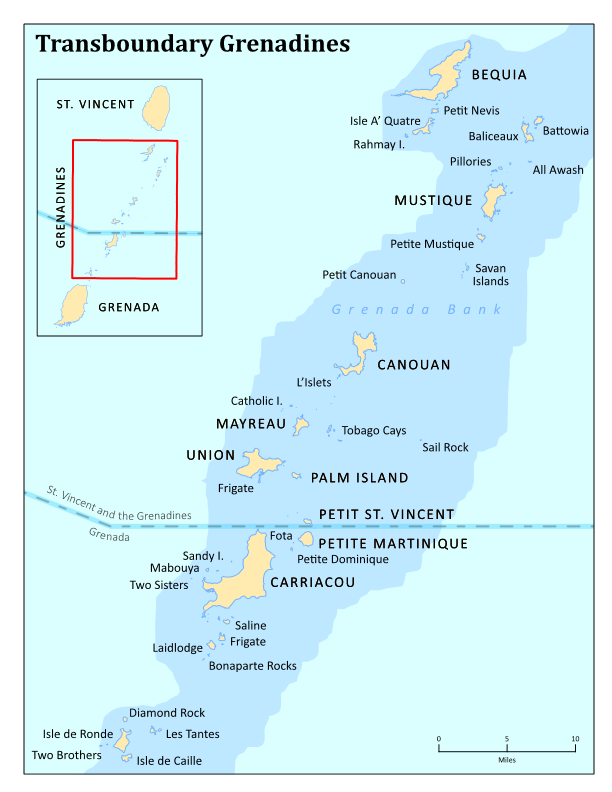 9 of the Grenadines islands are inhabited, 5 of these have a small airport. ALL of these and quite a few of the cays and rocks have fantastic anchorages which makes the Grenadines an ideal sailing destination. Spread North to South over about 40 miles, they offer some exhilarating open water passages as well as laid back short distance trips. This means that a sailing trip could be as short as 2 days, one way North to South could get you acquainted with some of the highlights of the Grenadines. The Argyle International Airport (SVD) in St. Vincent opened in 2017, at the time of this writing the only regular long distance flights are operated by Caribbean Airlines from JFK. Air Canada and Sunwing Airlines fly to SVD in the winter season. Update May 2018: AA is going to add a year round weekly flight from Miami on Saturdays. Major nearby hubs are Grenada,(GND) Saint Lucia Hewanorra (UVF), Barbados (BGI) and Martinique (FDF). Liat, the Grenadine Air alliance and private charters connect to SVD. for advise on itineraries in combination with a yachting vacation.